KS tenants, terminate your residential tenancy for health and safety reasons by serving your landlord with this Kansas Tenant's 5 Day Notice of Termination. The Notice informs the landlord that the tenant intends to vacate the premises pursuant to K.S.A. 58-2552, because the landlord has failed to deliver the premises in compliance with applicable housing and building codes that materially affect the health and safety of tenants. The tenant is also requesting that the security deposit be returned within 30 days. A Service of Notice form is included to record the details of how the Notice was served on the landlord. 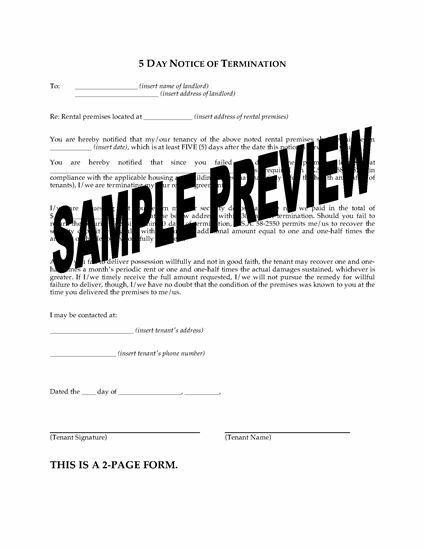 This Kansas Tenant's 5 Day Notice of Termination form is provided in MS Word format, and is easy to download, fill in and print.